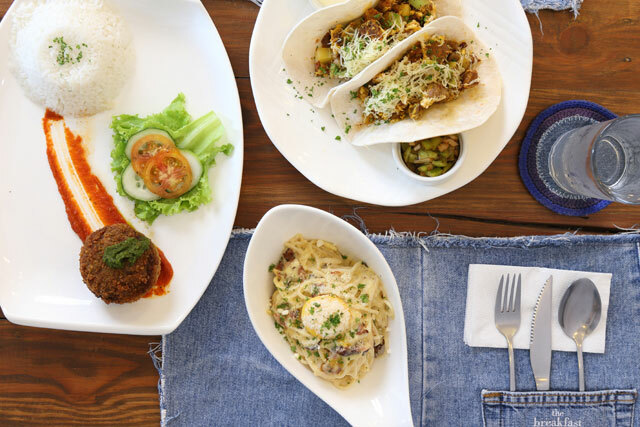 (SPOT.ph) Maginhawa Street in Teachers Village, Quezon City, is foodie heaven. A wide range of Western and Eastern cuisines are well represented along the strip, costs are flexible depending on your budget, and you can choose to have a sit-down meal or just eat by the roadside—which can actually be quite fun. The experience is like being at a food fair—great food choices left and right, all of them offering great gustatory stories. And while you probably have your favorites, chances are, new places have opened that you haven’t tried yet. 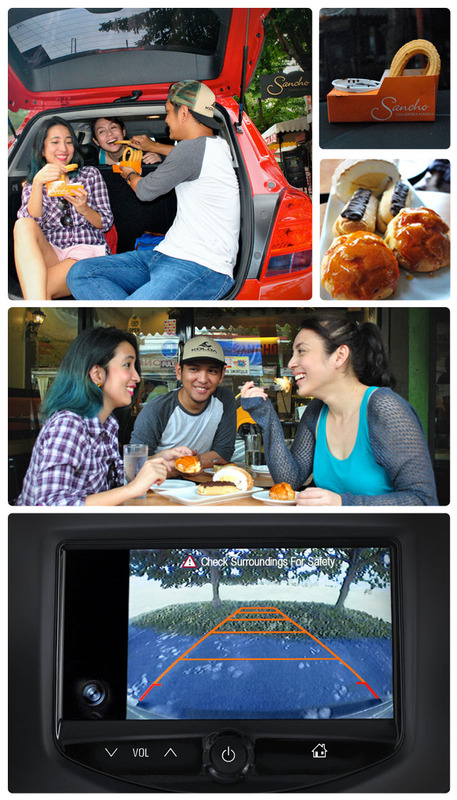 On your next visit, take a ride that fits your entire barkada and allows you to see your options clearly. Take the new Chevolet Trax, for example. It's agile, spacious, and smart. The Trax's large windows and a higher seating orientation lets you easily spot old dining favorites and spy new joints along the way. It's 1.4-liter turbocharged engine will also have enough boost to carry you and your barkada, no matter how full all your tummies are. And with its Electric Power Steering, the city-smart crossover SUV can easily maneuver into Maginhawa’s tight parking spaces. 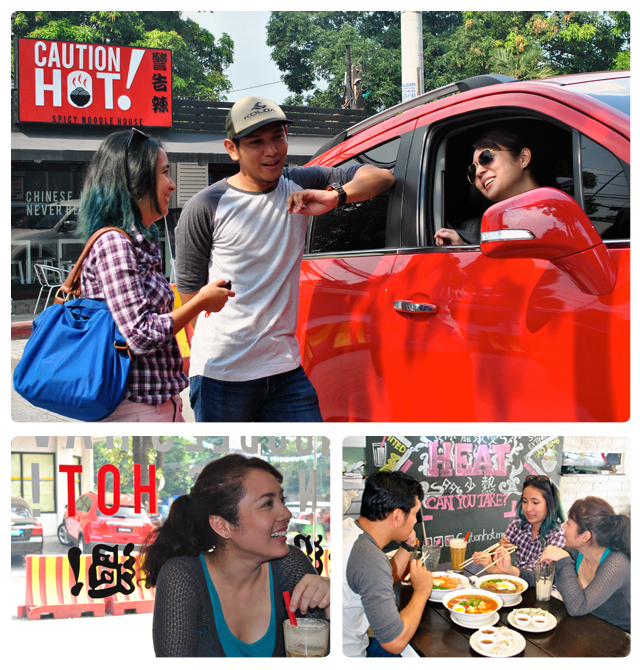 Check out our latest tour of Maginhawa Street and stay updated. Are you from south of the metro? Don’t fret; the trip will be worth it. Already a resident of Quezon City? Surely, you already know what a lucky duck you are, food choice-wise. It was Professor Plum, in the kitchen, with a platter of Jenga Cheesticks! What?! That’s the kind of fun you can have at Snacks and Ladders, a unique board game café that lets you play all you want for a P150 tab per head. Incidentally, try the crispy Jenga Cheesticks (P129), house-blended Cards Against Humanitea milk tea (P89) and But Wait There’s Smores (P149) while playing Risk, Funny Or Die, or any of the restaurant’s numerous board games. When you visit, take a ride that has enough space and storage for the entire crew, like the new Chevrolet Trax crossover SUV. 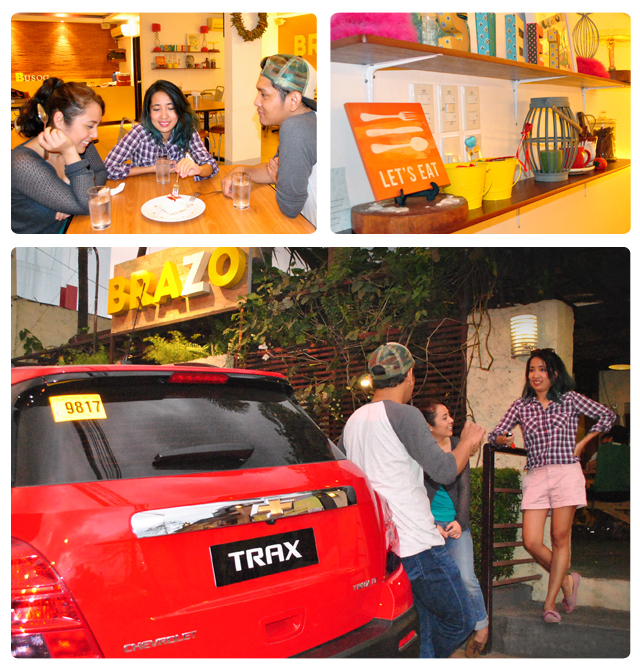 You'll comfortably fit the entire barkada and all your belongings in the Trax. Besides, it's always more fun when everyone's around to play a game of Cards Against Humanity. Okay, so it’s not technically along Maginhawa, but you’ll definitely see the big, red sign with an exclamation point as you drive through. Looking out from the large windows of the Trax, the Caution: Hot! singage was clear as day. The way the Trax garnered stares as it was parking makes it pretty hot, too—just like the food offerings here. If you like spicy mami, Caution: Hot! is your joint. Customizable from the toppings, to the broth, the noodles, and the spiciness, your perfect bowl is just four steps away. Try the Taiwanese Beef Slices (P185) with Szechuan broth and egg noodles, with a 2nd Degree Burn spice level. Be warned of the "Ultimate Burn" option—it’s really, really hot! As we all know, breakfast is an excellent choice any time of the day. Make your way to this homey restaurant and share the morning glory experience with friends by ordering one of The Breakfast Table’s signature “Farmer’s Platters.” Our pick: the Big Farmer’s Feast (P699), which has two kinds of longganisa, bangus tinapa, pusit or danggit, tapa, scrambled eggs, garlic rice, and your choice of atsara or ginisang kamatis. With great friends, all comfortably seated in the Chevrolet Trax, driving to The Breakfast Table is your best bet to start the day. The name says it all: pop into Theo’s, and be greeted by the rich aroma of freshly brewed coffee and delightful pastries. 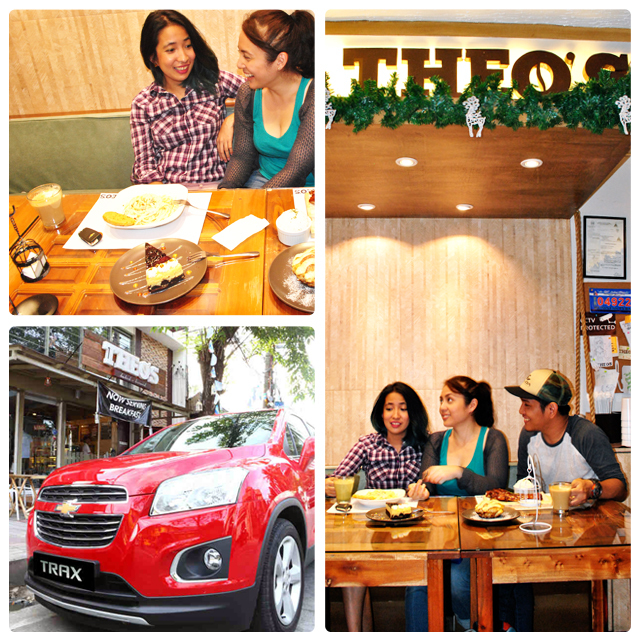 Theo's is a top-to-bottom, appetizer-to-dessert kind of place—in the same manner, the new Trax is an all-in-one package of power, fuel efficiency, and style. Theo's is a great place for an intimate meal, and your date will surely feel like the belle of the ball being ferried in the uber-stylish Trax. Make sure to try the slow-braised, creamy Osso Buco (P220) and for dessert, a slice of Berry Brownie Cheesecake (P110) to satisfy your sweet tooth. You might have trouble parking because the slots in front of Sancho are quite tight, but that's no problem for the Trax. Not too big and also not too small, this crossover SUV capably fits into any parking space. 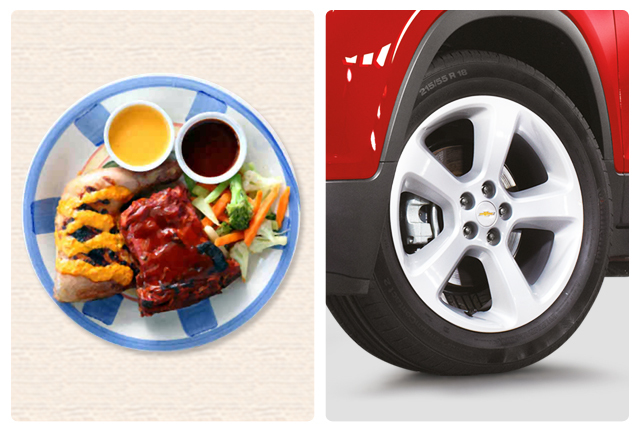 And with the Trax's reverse camera and backup sensors, you're sure to slot in with ease. Because, you'll agree: Dinner is never complete without dessert. Try Sancho's trademark Churros con Chocolate (P88)—light and crispy, with a dark, slightly bitter chocolate dipping sauce that is good on so many levels. But aside from dessrt, Sancho’s Paella Valenciana (P295, good for two) and Callos (P230) are faithful to traditional recipes, and are great entrée options for any meal of the day. And if they’re available on the day, try the ecclairs and cream puffs. Solid! The trip down the road to the next stop was more fun thanks to the tunes bumping out of the Trax's MyLink infotainment system. The craving for peri-peri chicken isn't easily met by just any other grilled chicken. When it comes around, consider Tornado Peri-Peri Chicken for its simple, straightforward, yet incredibly delectable take on the Portuguese specialty. Served up in your option of quarters (P125), halves (P240), or wholes (P430) with savory peri-peri sauce, the chicken here is sure to satiate your peri-peri needs. Opt for their ribs or steak if you aren't feeling chicken, and for their spicy sauces like Tiger's Fury or Dragon's Breath if you're feeling a little daring. You and your hungry barkada will surely enjoy Brazo’s “Busog Platter” (P1198), comprised of a whole Iberian Chicken (one of their best sellers) or crispy pata, BBQ ribs, a tinapa roll, a whole boneless bangus, drinks, and rice good for four. And, no doubt, you’ll also want to try their signature frozen Brazo de Mercedes (P85, slice)—smooth, creamy, cool, and with just the right amount of sweetness—the perfect way to cap off an equally wonderful meal. Getting the whole group there with you is no problem in the Trax, especially with it spacious interiors and a variety of flexible seating orientations. And with all the fuel savings you'll get from it's efficient engine, you and your friends will have extra dough to spend on good food. Unlike the Trax—whose exteriors are quite stylish—Mexican Express' facade is pretty ordinary. But don’t let the modest exteriors fool you—this place serves what is possibly the best value-for-money Mexican grub along the entire Maginhawa stretch. 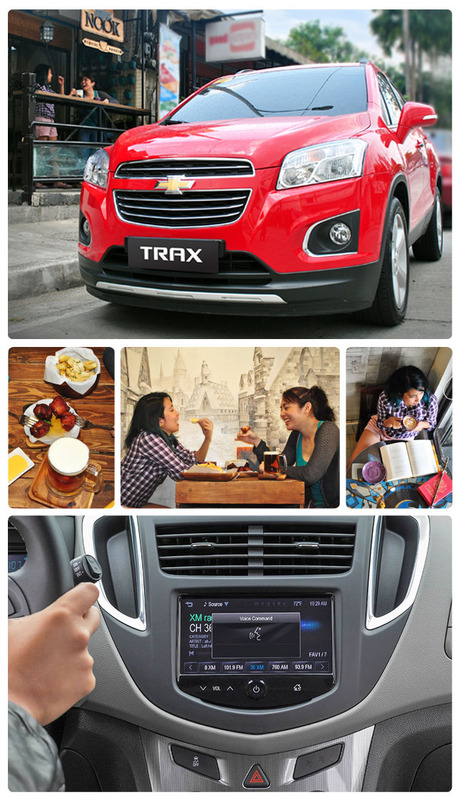 You'll get the same great value proposition for the Trax, which starts at PHP998,888. Pop into Mexican Express and try the Super Beef Burrito (P149)—a hefty tortilla roll filled with generous amounts of beef, cheese, veggies, rice, and topped with Mexican Express’ signature salsa and sour cream. Pair it with an order of Nacho Grande (P129) and complete your Mexican dining experience. Calling all Harry Potter fans: make a pilgrimage to The Nook, pronto! One word: “Butterbeer.” Try a glass of The Nooks Harry Potter-inspired, non-alcoholic creation (P100, regular; 150, upsize) and you’ll feel like a student at Hogwarts. Occupy a space at the second floor of the café, where all Potter-ness happens (games, story-telling, trivia trading). Come in your best wizard costume and get right into the Potter-mania offered at The Nook. Aboard the Trax, though, you can definitely start some of yor own safe wizardry using the Siri Eyes Free function which allows you to give the Trax voice commands so that you don't have to let go of the wheel. If choosing a restaurant along Maginhawa becomes too difficult, pop into StrEAT—a food truck and pop-up resto collective that houses a wide range of eats and, in a way, is a microcosm of the Maginhawa dining experience. Grab a quick beef burrito from Mexikombi (P220), try the Lamb Kebab meal (P250) at Bricks and Copper, and satisfy your sweet tooth with a Carnival (P100) from The Lost Bread. And believe us when we tell you that these are only a few of the options you have at StrEAT. 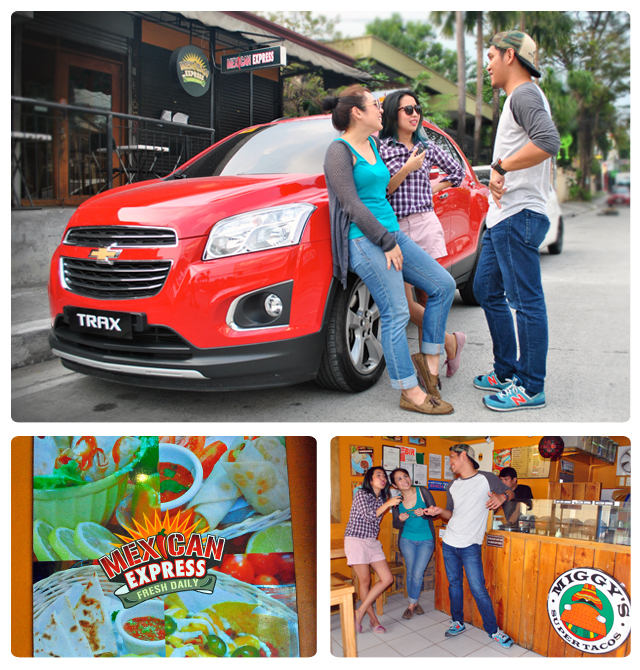 On board the new Chevrolet Trax, getting around with the barkada for food trips has never been as fun, convenient, and stylish. Having the Trax city-smart crossover SUV allows you to create your very own urban trails, while remaining confident behind the wheel. It's the car that's perfect for all your urban adventures.